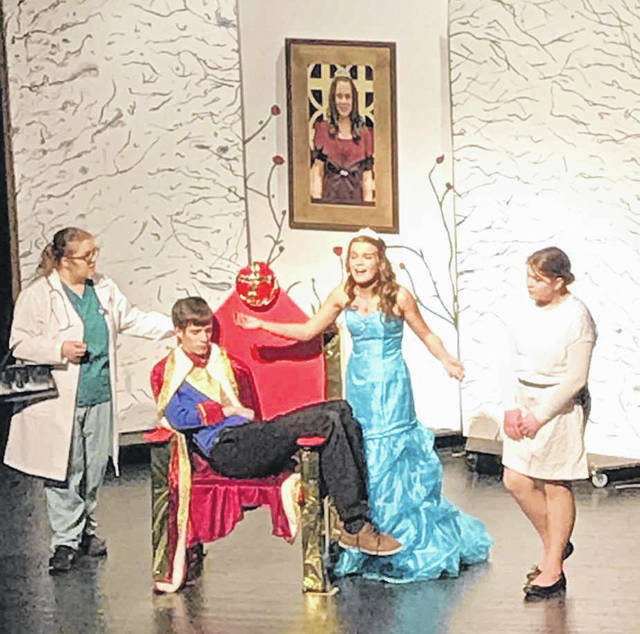 FORT LORAMIE — The Fort Loramie High School Drama Club is presenting “Puss ‘N Boots, A Tale of a Tail,” by Steph Defarie, beginning on Friday, March 29, at 7 p.m. Shows will also be held on Saturday, March 30, at 7 p.m., and Sunday, March 31, at 2 p.m.
Tickets can be purchased at the door, starting at 6:30 p.m., on Friday and Saturday, and 1:30 p.m. on Sunday. Prices are $8 for adults and $5 for students. https://www.sidneydailynews.com/wp-content/uploads/sites/47/2019/03/web1_PussInBoots.jpgFrom left to right, Dani Paulus, as Doctor Broccoli; Kaden Mescher, as King Ferdinand; Lydia Stricker, as Princess Philomena; and Alana Stricker, as Nursie, perform during a dress rehearsal of the play, “Puss ‘N Boots.” Courtesy photo.